The Cavaliers New Year’s resolution to improve the team didn’t go as well as they hoped; it was the total opposite of what they had in mind. The return of their starting point guard (hip injury, out since May), Isaiah Thomas, caused lots of distress and situations that led the Cavaliers to a very deep slump for over a month. Thomas played 15 games with the Cavs and frankly, he was not prepared for the challenge. He was clearly still injured, as his statistics were arguably worse than some rookies, and he was the wall that got in the team’s way of advancing. Since he returned, LeBron and his teammates weren’t clicking as they did prior to his return. They were statistically the worst team in NBA history, as their offense was slowly diminishing and very inconsistent, as well as their defense being an all-time worst in the league’s history. The team’s struggles for this 2017-2018 season were clearly visible and because of this, the Cavaliers’ front office was planning possible trades that could occur by the NBA trade deadline (February 8). The newly acquired/signed players in the off-season, Isaiah Thomas, Jae Crowder, Jeff Green, Dwayne Wade, Jose Calderon, Cedi Osman, Derrick Rose and even some players that were already part of the Cavs roster, Iman Shumpert and J.R. Smith were all players that were good at times, but also inconsistent at times. Those players were in desperate need of direction and change, they either needed to improve their performances or they had to get cut out/get traded from the team. Only time could tell what would happen in the future with this roster, the chemistry, the struggles, lack of communication and trust, and the overall direction and performance of the team. 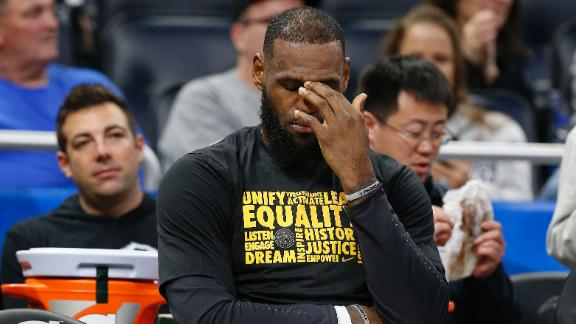 These inconsistencies and struggles caused LeBron James’ to express feelings of desperation and worry for A) the absolute downfall of his team and B) the possibility of not making the NBA Finals for his 8th consecutive year. Without a doubt, LeBron is an all-time great, possibly greater than or equal to the same greatness Michael Jordan contained. The argue that many are making is what if LeBron makes the Finals, will he make it, will his team make the playoffs, will he come out victorious or will he lose for a 2nd consecutive year, and if he loses this Finals, will he still be in talks of being the Greatest of All-Time (GOAT).